Welcome to Day #3 of our RemARKable Open House Blog Tour –you are going to wowed by the creativity and imagination of my fellow team members.Each RemARKable on this tour is offering the same class to their customers that includes the HOUSE PDF/Pattern, and an IDEA sheet with a total of 30 house ideas on it. As one of my customers if you have not yet registered for the class, my class is being held on FEB. 19 or 20. Click on my class schedule to the right to view the details. To view the house we will make in the class, look at my post for Jan. 29. Today is the last day of the tour. Have you enjoyed it? Aren't the houses and goodies inside amazing?! So far in my posts you have seen a cute way to package packets of seeds and plant markers. 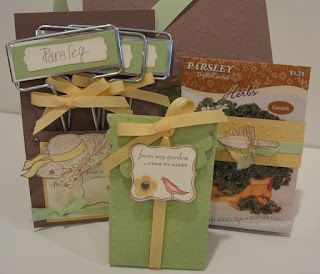 Today's sample shows an adorable way to package the dried herbs that were grown to give away! Isn't it cute? I used the bag with scallops die for the Big Shot to make it. How fun! I hope you have enjoyed this tour. Leave me a comment and let me know! So…. are you ready to move into the Remarkable Stampers neighborhood yet? If so, we would love to have you!! We are friendly, supportive of each other, and as you can see very creative and we love to have new people join our community. To find out how you can be a part of our neighborhood, contact your RemARKable Demonstrator on this tour. Stampin’ UP! has a great :”move-in” special going on right now . If you don't have a Demonstrator you currently work with , feel free to contact me.